Chicas Latinas de Sacramento tiene el gusto de organizar por segundo año consecutivo la campaña de recolección de zapatos ” Starting on the right foot” que ayuda a escuelas locales. Este año estamos patrocinando a la escuela Woodbine en el sur de Sacramento. Nuestra meta es de recaudar 700 pares de zapatos nuevos para niños de entre 5-12 años de edad. Estamos invitando a la communidad a que nos ayude a llegar a esta meta y ayude a los niños a empezar el año escolar bien. Tenemo tres localidades donde pueden dejar su donacion: Kershaw, Cutter & Ratinoff (401 Watt Ave.), Capsity (2572 21st St.), (448 Howe Ave). O tambien pueden acudir a nuestra Fiesta Communitaria este 28 de agosto que toma lugar en Sol Collective, o nuestro marathon de zumba el 30 de agosto en Result Transformation. 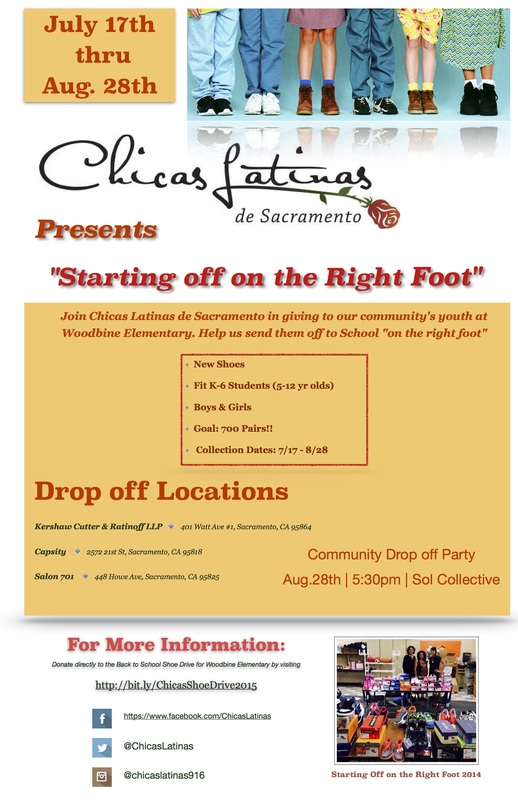 Join Chicas Latinas de Sacramento and our generous friends and donors at our “Starting Off on the Right Foot” Community Party! Drop off your final shoe donations | Stay to celebrate! This year we’re sponsoring Woodbine Elementary School — with a goal of 700 pairs of NEW shoes. Can you help?!?! When we asked school staff members what the students are most in need of when starting the new school year, we were simply told, “shoes.” Shoes that fit and shoes in working condition… free of holes and torn soles. Back-to-school shoes, a basic need to most, are a luxury item to these children. For that reason, Chicas Latinas members are host anual shoe-drives for local schools and are ask the community to join us for “Starting off on the Right Foot,” in an effort to provide shoes for these students as they enter into the new school year. Shoes must be new and should fit 5-12 year old students, boys and girls. Please share this event and consider asking your colleagues, friends, and family to donate A pair of shoes… I have 100% confidence we can collect 700 pairs of shoes, with your help! 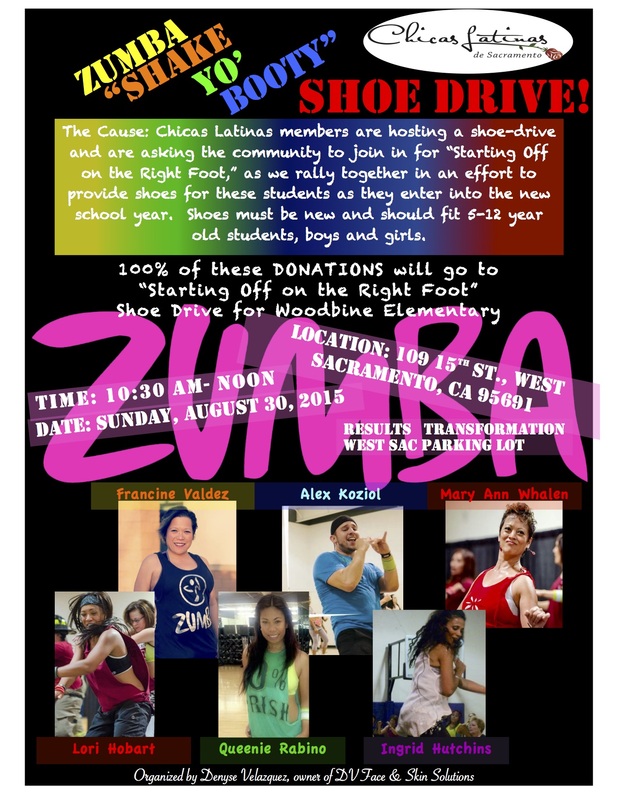 You read right Sacramento, you’re invited to a Zumba “Shake Yo Booty” Shoe Drive! The fee for the awesome Zumba class is a pair of new shoes for Chicas Latinas de Sacramento’s “Starting off on the Right Foot” Shoe Drive. Please join us in giving, breaking a sweat, and having some Zumba fun. Share, invite your friends and family members, and help us reach our goal of 700 pairs of new shoes for the children at Woodbine Elementary School. A special thank you to everyone listed below, for making this wonderful event happen. We were approached by Denyse Velazquez, who informed us that they were putting on this event FOR Chicas Latinas’ Shoe Drive! We’re extremely grateful for all who came together in support our shoe drive and our community’s youth. Thank you!